Deploying the provocative idea of the ‘subaltern citizen’, this book raises fundamental questions about subalternity and difference, dominance and subordination, in India and the United States. In contrast to other writings on subordinated and marginalized people, the essays presented here devote deliberate attention to diverse locations of subalternity: in the conditions and histories of slaves, dalits, peasants, illegal immigrants, homosexuals, schoolteachers, women of noble lineage; in the Third World and the First; in pre-colonial, colonial and postcolonial times. With contributions from a diverse group of distinguished scholars, the anthology explores issues of gender and sexuality, migration, race, caste and class, education and law, culture and politics. The very juxtaposition of different bodies of scholarship serves to challenge common perceptions of inherited histories – claims to American and Indian ‘exceptionalism’ – and promotes a new awareness, not only of shared histories and shared struggles in the making of the modern world, but of particularities and facets of our different histories and societal conditions that are assumed as being well understood, and hence often taken for granted. 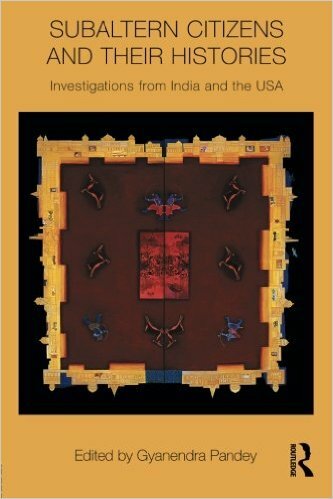 Subaltern Citizens and Their Histories will be essential reading for scholars of colonial, postcolonial and subaltern studies, American studies, US and South Asian social science and history. Pandey, Gyanendra. Subaltern citizens and their histories. London: Routledge, 2010. Print.